Until the middle of the eighteenth century books, like any other commodity, were sold from canopied wooden stalls set up on the cobbles on market days. Along with the wool merchants, corn dealers, butchers and bakers, booksellers offered their goods to the passing public and tried to keep them protected from thieves and the weather. Retail shops in solid buildings were rare in provincial cities. Books came into town by ship and were carried from the harbour by horse and cart. Presumably, as today, between fair days, booksellers’ homes were filled with piles of books awaiting their next outing. The first named bookseller in Dundee was James Stark. He set up shop about 1750 at ‘the back of the Guard,’ beside the inn of his friend Thomas Morgan. Between them they attracted the post-Jacobite intelligentsia of the city, those comrades whose Stuart sympathies had not changed but faded into a general sense of being ‘agin the government’. The one newspaper to reach the city then was the Edinburgh Courant, of which a single copy could be consulted by customers and discussed at length and with heat during breaks from business. Stark sold dolls and toys as well as bibles, catechisms, school books and stationery. 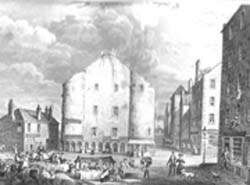 By 1783 there were three more booksellers, James More, at the Cross, of whom I know little, George Milne, or Milln, in the Murraygate and Robert Nicoll in Castle Street. … tumblers and a small bowl were sure to be produced for visitors and he constituted himself the judge of the quantity of punch his visitor should drink.’ Perhaps because of his conviviality, he prospered and it was at this welcoming establishment that the radicals of the city habitually gathered. James Saunders, the campaigning lawyer and drafter of reforming bills, Robert Rintoul, who began his journalistic career at the Dundee Advertiser and went on to some fame as the editor of the Spectator and George Kinloch who, after being exiled for inciting rebellion became Dundee’s first MP were accustomed to meet there. Robert Nicoll was a poet. He set up shop with a circulating library as added attraction but gave more attention to his verse and his radicalism than to his bookselling, having, it was said, ‘a rather sensitive mind’. He wrote regularly for Tait’s Magazine and, when his bookshop predictably failed, accepted the editorship of the Leeds Times whose circulation quadrupled under his management. What did they sell, these radical Dundee booksellers? I was lucky enough to find the book orders for the year 1799 of a shop in Brechin, near enough to Dundee to justify a guess that the market was not too different. Peter Wilson sold in that year, as well as the predictable hundreds of chapbooks, bibles and Latin grammars, Kames’s Gentleman Farmer, Dr Johnson’s Tours, The School for Scandal, Macbeth, Robin Hood, The Gentle Shepherd and Monboddo’s Savage Girl as well as Beattie’s Scotland and the Letters of Junius. 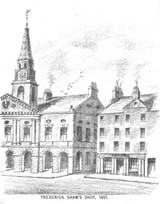 Thomas Donaldson, the fifth bookseller to set up in Dundee, opened his shop in 1791 at the top of the Vault in the piazza of the Town House. Business was not brisk ‘unless a chiel with a love for antiquarian lore found his way to inspect the shelves’ but there must have been a few of these chiels because, after twenty-two years of business, Donaldson took on an assistant, Frederick Shaw and eventually sold the business to him. By the middle of the nineteenth century the number of booksellers in Dundee had risen from the original five, to forty. At a time when the periodical and newspaper market was expanding rapidly, many of the forty were probably more newsagent and stationer than bookseller. Frederick Shaw, however, was an antiquarian by taste and nature, and a gentle, quiet man. He welcomed genuine book-lovers but found it difficult to tolerate noisy or rough people in his shop. A bookseller’s problems change very little in a couple of centuries. He worked on until he grew too old and frail and then handed over his business to his assistant William Kidd who established a very successful, very different kind of business which lasted into the middle of the twentieth century and is another story for another day.